How wide and deep do you want the wedging surface to be? If you will use your wedging table to dry out clay that is being recycled, or if you are planning on wedging large amounts of clay at one time, you will want a larger surface area than if you will only be wedging up a few pounds at a time. How tall should your wedging table be? Each table should be configured to suit the main person who will be using it, or an average if there will be a number of people using it. As a rule of thumb, a wedging table's height should be set at approximately the same height as the points of your hips. Proper height will decrease the discomfort of bending over a too-low table, or the inefficient use of your muscles if set too high. 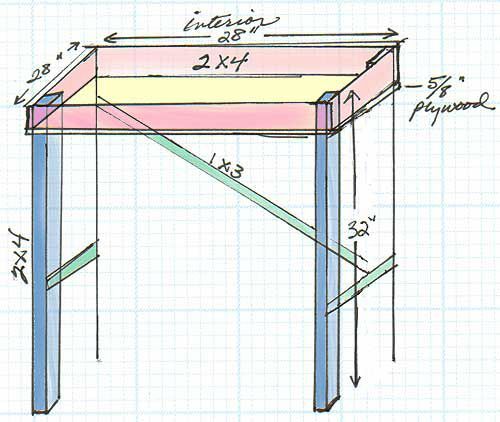 As you can see on my diagram, my wedging table is 32 inches high by 28 inches deep by 28 inches wide. I will use 2 x 4 lumber for the legs and sides, 5/8 inch (minimum thickness, you can go thicker) plywood for the floor, and leg braces made from 1 x 3 lumber. at least two clean plastic buckets and a scale, which you will need later for the plaster. This project will go much easier if you can recruit another person to be your helper. If no one is available, I'd highly recommend you use a good woodworking bench that can clamp onto the lumber as you work with it. Carefully measure then cut all your 2 x 4 lumber into the correct lengths using the circular saw. If you have spikes of wood left on the ends, I recommend you knock them off with the hammer. As you cut the lengths, mark on each piece how long it is. (This will help avoid confusion as you work.) Make other marks as needed to show adjoining pieces (see photo). If you look at the diagram again, you'll see two of the wall 2 x 4's are bracketed by the other two wall 2 x 4's. For the moment, set aside the longer set of wall pieces. On two of the legs, mark three points for screws, making sure to keep them within the area of the wall 2 x 4 they will be joined to. Using a drill bit that is a bit smaller than the wood screws, drill pilot holes all the way through the wood at those points. Once both legs have been drilled, screw three 3" wood screws through the holes of each leg so that about an 1/8 inch of the tips come out the other side of the wall. Place the top of the first leg in place on the end of the wall piece. Tap down with the hammer to create indentations, which mark where the screws will enter the wood. Do the same at the other end of the wall piece with the other leg. Drill shallow pilot holes, about one-half to one inch deep, where you have marked the indentations. Spread wood glue on one end of the drilled wall piece. Set the leg piece on it, matching screws to pilot holes. Screw the leg to the wall. Repeat with the second leg. Repeat the entire process with the other shorter wall piece and remaining two legs. Mark three screw holes on each end of the longer wall pieces, so that they will go into the side of the legs. Drill pilot holes all the way through, set the screw in, mark the legs so you can make the pilot holes in the leg, then drill the shallow pilot holes.Spread glue on the wall were the two pieces will meet, then screw the legs in place. At this point, you should have the legs and walls attached to each other. The table begins to take shape. If you have excess plywood, so that it cannot lay flat on the bottom of the walls due to the legs, you can either cut off the excess at one side, or you can notch the plywood for the legs, as I have done in this photo. Notching the plywood allows the plywood to overlap the edges of the walls slightly, which in turn means that the screws will not be near the edge of the plywood once they are set. This, in turn, decreases the likelihood of the plywood cracking between the screw and the edge of the flooring sheet. Before going further, set the floor in place, without any glue or screws. This dry run ensures that the floor will fit perfectly, without taking the chance of misaligned screw holes or the mess of glue in the wrong places. Once the floor piece has proven ready, set the floor in place, marking at least one spot so that you can place the floor in again, in the exact same position. Drill pilot holes directly through the plywood and into the bottom of the walls, spacing the holes about four to six inches apart. Remove the floor. Spread glue on the bottoms of the walls. (cotton swabs or rolled paper can work effectively as spreaders.) Replace the floor, in the correct position so that the pilot holes match, then screw the floor to the walls. As you can see in the photo above, I used a Phillips head attachment on my drill in order to set all the wood screws. Once the main frame is completed, add 1 x 3 bracers on two sides and on the back of the table. The side braces can be parallel to the ground, but at the least, the back bracer should be set at an angle to improve the wedging table's stability. Again, use both wood screws and glue for the strongest possible joints. You need to allow time for the wood glue to cure. Generally, most wood glues are completely cured within 24 hours, but some can need 48 hours before you should continue with the next step. Check the label of your glue for information on that particular glue's guidelines. Once the wood glue has cured completely, you need to caulk all the interior joints in the box of the table where the plaster will be poured. Press the caulk into the joint areas, so that it pushes deeply into all cracks. Once applied, the caulking will now also need to cure. Check the label for this information on the brand you have used. If possible, set the wedging table where you want it before mixing and pouring the plaster into it. For example, my own is situated in my kiln shed, as its primary use is in recycling clay, which I do outside. However, if your wedging table will be in an area where clay is being worked or in an area you don't want forever messed up, mix and pour the plaster into the table outside. Warning! Plaster and plaster dust must not be allowed to get into any working clay. It will literally explode in the kiln during firing! Have a minimum of two clean buckets. One to mix the plaster in, and one for you to rinse your hands in. Line the rinse bucket with a trash bag prior to filling with water. Only use fresh plaster. Do not use old plaster, as it will almost certainly have lumps in it which makes it unusable. Only use drinkable tap water or distilled water to avoid adverse chemical reactions. Water must be about 70°F (21°C) for optimum setting time. Weigh out everything and make all calculations before beginning the mixing. More on that below. Sift plaster into water slowly. Do not dump plaster in. Allow plaster to soak 1-2 minutes before you begin stirring it. Use your hand to stir it gently (don't create air bubbles) and break up any lumps. Rinse your hands in the lined bucket. Do not dump this water into any plumbing fixtures! Once the plaster has settled for at least one day, pour off the water and discard the remains in the trash. Pour the plaster into the wedging table slowly and carefully. Tap the table to release any air bubbles. To remove the pour marks, smooth out the surface using a length of wood or other straight edge. Dry the plaster slowly and as evenly as possible. For such a large volume, drying time can be two weeks or more. Estimate your wedging table's volume in cubic inches. (For mine, the calculation was 28 inches x 28 inches x 4 inches = 3136 inches cubed.) Divide by 231 to give gallons (or 58 to give quarts. (Again, for mine 3136 / 231 = 13.6 gallons.) Subtract 20%, since that much volume will be taken up by the plaster. (For mine, 13.6 x .8 = 10.9 gallons.) This is the amount of water you will need. Each gallon of water requires 11 lbs. 6 oz. (5,171 grams) of plaster. Ergo, for my table's volume, I needed 123.76 pounds of dry plaster.